The windshield repair process is a time-tested and proven way to extend the life of your windshield. In fact, many insurance companies trust the windshield repair process to the point that they are willing to cover the full invoice balance when you opt for a windshield repair over a windshield replacement! In order for a windshield repair to work correctly, the repair must restore the windshield's strength and structural integrity (why is this important). This is accomplished be replacing the air in your crack or rock chip with a specially formulated windshield repair resin. The resin is then cured with a UV light to quickly get you back on the road. 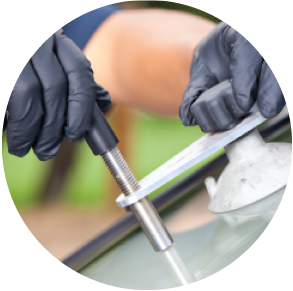 There is a limit to what the windshield repair process can fix. Extensive damage such as large chips, holes through the glass, and cracks longer than 6 inches have already destroyed the glass' strength. To attempt a repair with this type of damage would be a wasted effort. Once your windshield is chipped or cracked, the clock starts ticking. Over time, even the smallest rock chip or crack will begin to spread. Changes in temperature, weather, and even small bumps in the road can change a small chip into a big problem in just a matter of seconds! As soon as your windshield is damaged, call the windshield repair specialists at Searcy Auto Glass for a quick repair on the spot. With insurance, it may even be FREE!